OBJECTIVE: To help people help themselves to knowledge. M.A. in History, May 1994: 3.7 Grade Point Average (out of possible 4.0). Western Illinois University, Macomb, Illinois. Primary emphasis: European history. ... Secondary emphasis: U.S. history. Thesis topic: Significance of the Katyn Massacre (1940) to the West. M.S. in Library Science, August 1973, University of Illinois at Champaign-Urbana. Knox College (Major: German), Galesburg, Illinois, Fall 1965. U.S. Military Academy, West Point, New York, Summer and Fall, 1964. Rock Island Senior High School, Class of 1964. "We Were Soldiers," review, AMERICAN HISTORICAL REVIEW, February 2003. "Black Hawk Down," review, AMERICAN HISTORICAL REVIEW, October 2002. "Building the Cardstock Fleet," NAVAL HISTORY (USNI, Annapolis MD), May/June 2000. Various postings on Internet, including "The Cold War's Beginning and Ending ... with Katyn." (H-DIPLO, 1995). Written testimony in [May 1995] U.S. Senate Hearing 104-40 appendices, re: Smithsonian Institution's "Enola Gay" exhibit. Military games section in MAGAZINES FOR LIBRARIES, 1995, 1997, 1999, and forthcoming edition, Bill Katz, ed. Various library information and education guides and handouts: WIU departments' style manual list, Western Illinois/Quad Cities library computer index guide, etc. "German Eagle vs. Russian Bear: A World War II Russian Front Boardgame Kit," 2d ed., ERIC (Educational Resources Information Center) Document ED 361 256 [microfiche]. "A New Library Patron: The Systemwide User." ILLINOIS LIBRARIES, May 1993. "A Place for Games and Simulations in Academic Libraries: Are They Digestible?" ERIC Document ED 330 339. 1990. A series of "50 Years Ago" (WWII history) articles in the local newspaper. "Best Laid Plans ... ASPIN and the Quest for Total Depository Collection of Alaska State Publications," ILLINOIS LIBRARIES, November 1989. Library research skills and strategy instruction classes, WIU, January 1989-June 1994. "Campaigns of World War II, " Juneau-Douglas (Alaska) Community College, Spring 1977. Various lectures: Military gaming (for U.S. defense policy class), etc. Western Illinois University Library, January 1989-June 1994. 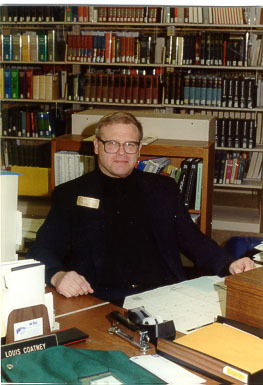 Reference Librarian, January 1989-June 1994. Part-time: Quad Cities Library Services Coordinator, June 1992-October 1992; WIU Map Librarian, Summer 1991-Summer 1992, Government Publications, January 1989-Summer 1991. Alaska State Library, Juneau, September 1973-January 1989: Documents and Reference. University of Illinois High School Library, Urbana, September 1972-August 1973: Assistant Librarian. U.S. Army, January 1967-January 1969 -- Continental U.S. and West Germany. WIU (Student-Faculty-Administration) Council on Student Welfare (CSW), 1991-1994. WIU Chess Club Advisor, 1990-94; Member, 1989, 1994-98. WIU Military History Club Co-Advisor, 1990-91. World War II Studies Association, Member, 1986 and various years since. Phi Kappa Phi, 1992 and various years since. North Central Association High School Accreditation Team, November 1992. WIU Vice President for Advancement and Public Services Search Committee, 1990. INTERESTS, LANGUAGES: Chess, films, military and naval history and gaming, classical music, Alaska, general reading, sailing, jogging. German, 3 years; French 2 years; Russian, 1 year. Would you like to return to my home page? or to my personal information page?